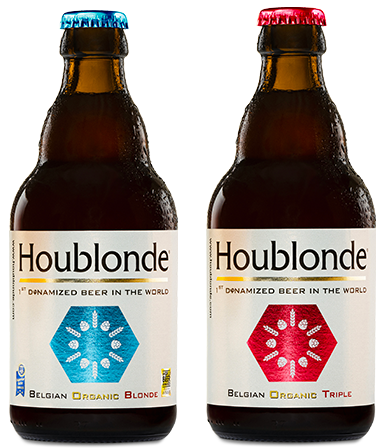 The original feature of HOUBLONDE is that it has been brewed with very pure natural water that has been dynamized– i.e. the water has passed through a very powerful vortex to give back its essential properties invigorating water comparable to that found in nature! The whole process of water regeneration is elaborated according to a protocol which remains our secret! Did you know? Beer is made up of 90% water! So it is very important that brewing water benefits from all of the invigorating and regenerative properties of water of absolute quality! « After drinking it, we feel an intense freshness, a unique bouquet and a beautiful length in the mouth. A surpising beer, like no other. – Bill, 42.